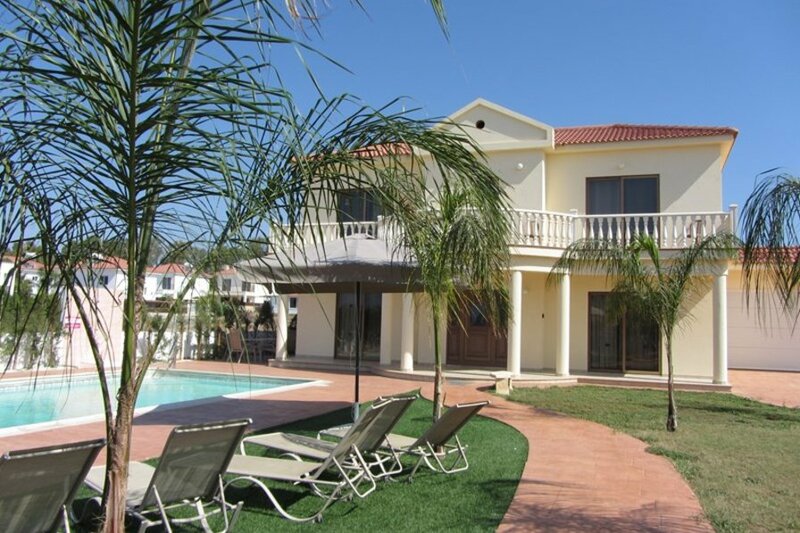 Villa Barbara is located on a nice elevated location 700 meters from Nissi beach, 2 km. from the center of Ayia Napa. It is a modern five bedroom villa tastefully furnished to high standards. Stylish interior and comfortable exterior areas guaranty a perfect combination for unforgettable holidays. This exceptional mansion is situated within a short distance from the beautiful and famous Nissi beach. As you walk in this spacious impressive villa you are welcomed initially by the fresh green lawns. The front of the villa is dominated by a large swimming pool lying in a 300 sqm garden covered with grass, that keeps our guests cool enjoying long summer days. The house has large living space with sitting room, dining area and a fully equipped kitchen which can satisfy all cooking lovers. On the ground level, there are one twin bedroom and a family bathroom with jacuzzi. The other four bedrooms are on the second floor, 3 of them with en suite bathrooms. Two of them have exits to large balcony with sea views. There is plenty of space besides villa to cook and enjoy your evening BBQ. Villa Barbara will definitely provide you comfortable and unforgettable holiday. Villa Barbara has 5 bedrooms in total 4 of them with twin beds (8 single beds) and one with a double bed; all bedrooms have built in wardrobes and air conditioning and heating as well as the living area. The ground floor is very spacious with open plan lounge kitchen and dining area. There are TV, satellite TV, DVD player & internet connection (FREE of charge). The dining area is furnished with a dining table that comfortably seats eight guests and large open plan fully equipped kitchen fridge/freezer, cooker, kettle, dishwasher, washing machine, ironing facilities, oven, extractor fan & all cooking utensils. The living room is furnished with modern leather sofas. The garden is fenced for privacy with a private pool (10 x 5 meters) with sun beds, umbrella, and garden furniture. There are build BBQ in the garden area, and umbrella where you can relax in the shade whilst enjoying a nice cold drink during hot summer days. Private parking is available free of charge. All necessary bed linen including bath towels are provided and with respect of your privacy, pool cleaning service is provided twice a week. Additional services are available on request. All living and bedroom areas have air conditioning with an allowance of 300 units per week included. Refundable breakage deposit of 500 euros payable cash on arrival is required. To be returned on departure if there are not any damages. The villa is on walking distance to all Amenities such as Bars and Pubs, Banks, Clothes shops, Coffee shops, Mini market Night clubs Pharmacy Restaurants Supermarket Hairdresser, Beauty salons, fitness studio Spa. There are lots of Activities in Protaras like Scuba diving, Boat trips, Cycling, Fishing, Swimming, Water sports, Jeep safaris, Horse riding, and Rock climbing.